Are you frustrated with your sales growth, unable to sign up new customers or not meeting your net profit goals? Are you a cloud services provider that is frustrated with your inability to sign up new customers in-spite of offering a highly reliable service ? Do you find it extremely difficult to differentiate your cloud services compared to the myriads of other cloud service providers out there? Do you feel stuck between the rock and a hard place due to your limited marketing budget and inability to hire a high quality sales force? If you are in this situation, do not worry, I have a simple, but effective “3 Steps to Boost Your Sales” solution for you that will break through this paradigm. With no additional marketing or sales investment, my solution will enable you to increase your sales dramatically. I will show you a 3 step process that will help you. 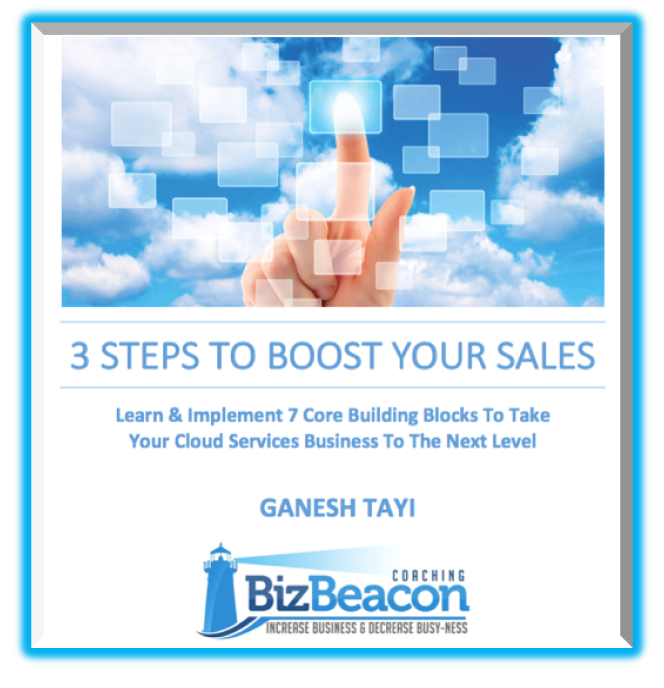 Download this E-Guide and I will guide you step by step on learning and implementing the 7 building blocks that will take your Cloud Services Business to the next level.